The sun rose bright and clear in my face; I had no choice but to get up and address the day. I lingered with my hosts, Pam and Steve until nine. Can you blame me? We had great coffee, blueberry crumble, fruit smoothies with walnuts and granola, and cantaloupe. 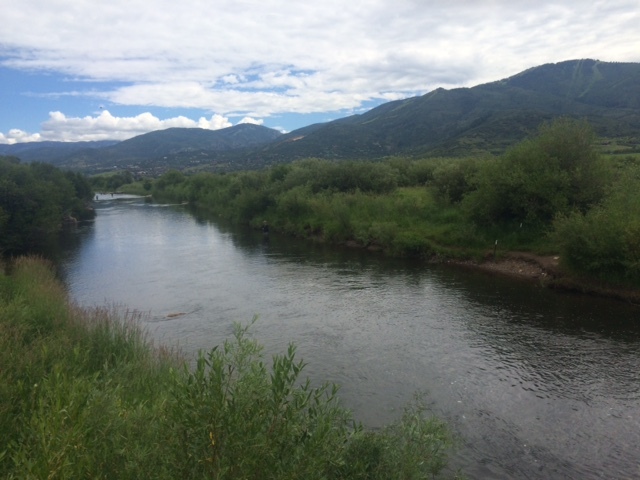 Steve told me road construction would lengthen my ride to Steamboat Springs, but since it’s not a route I usually do, or have any expectation about, I was very happy to hug the hills around Oak Creek and roll into the broad Yampa Valley about eleven. I had a hard time getting oriented in town, but eventually found Howelsen Lodge and the hall of Olympic Banners. Steamboat claims the highest number of Olympians per capita in the U.S. The park was packed with all ages of baseball players, Tae Kwon Doe classes, cyclists, and tricksters doing summer variations on the ski jumps. No wonder that Colorado is the fittest state in our nation. I was so pleased that the Western Motel let me check in at noon; though Peter Grubel, the 76 year old proprietor had so many tales to tell the process took about half an hour. After lunch I cycled to Steamboat’s industrial area to meet with folks from Honey Stinger energy foods and Moots custom bicycles. 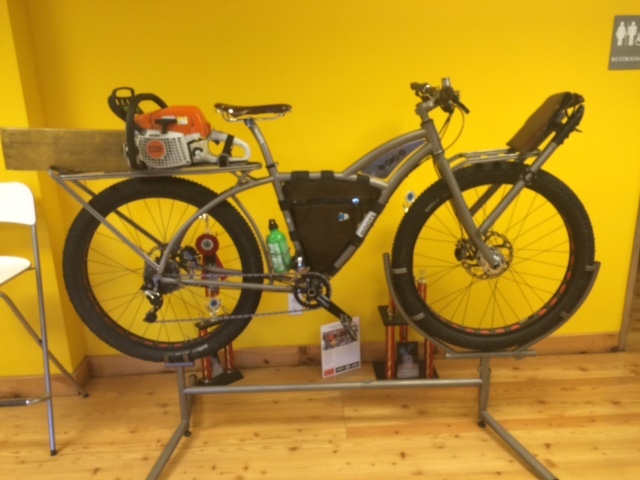 Moots has a trial maintenance bicycle that is like a cycling bulldozer for building trails as you go. Quite a different industrial base than I witnessed in Pittsburgh! I walked through Steamboat’s downtown at dusk. My two favorite details: the elaborate entrance to the Chief Theater and the western merchandise at F. M. Light & Sons, outfitters since 1905. The smell of the leather when you walk in the store is incredible.